Michael Leonard, (British b.1933), Bather Stooping Low, 2005. Alkyd-oil on masonite, 58.5cm x 54.5cm, framed. Michael Leonard, (British b.1933), Climbing Out, 2008. Alkyd-oil on masonite, 61cm x 52cm, framed. Michael Leonard, (British b.1933), Leroy in a Blanket III, 1972. Acrylic on masonite, 54cm x 58.5cm, framed. Michael Leonard, (British b.1933), Sneakers Englouties, 1976. Acrylic on cotton duck, 66cm x 67.5cm, framed. 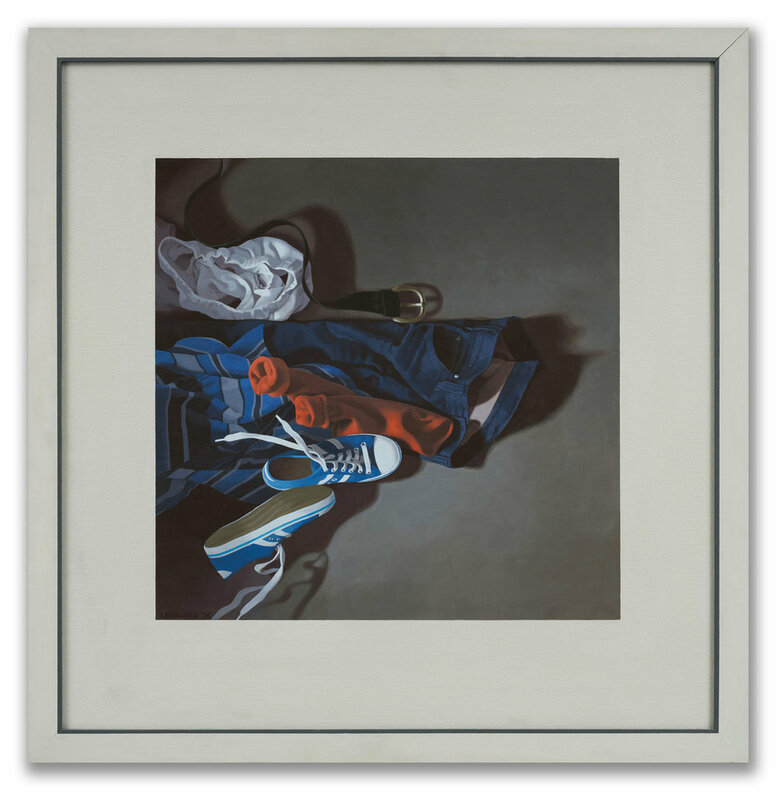 Michael Leonard, (British b.1933), Sneakers Englouties II, 1976. Michael Leonard, (British b.1933), Afternoon Tea, 1970. Acrylic on masonite, 71cm x 67cm, framed. Michael Leonard, (British b.1933), Female Bather on Gold II, 1989. Alkyd-oil on masonite, 66cm x 69cm, framed. Michael Leonard, (British b.1933), Cloud of Dark Hair, 2007. Alkyd-oil on masonite, 48cm x 40.5cm, framed. Michael Leonard, (British b.1933), Man's Back and Reflections, 1980. Graphite pencil on paper, 22cm x 12cm, framed. Michael Leonard, (British b.1933), Dressing 43, 1982. Graphite pencil on paper, 19.5cm x 14cm, framed. Michael Leonard, (British b.1933), Man, Bending, Turning, 1989. Graphite pencil on paper, 15cm x 18cm, framed. Michael Leonard, (British b.1933), White Hairbrush II, 2002. 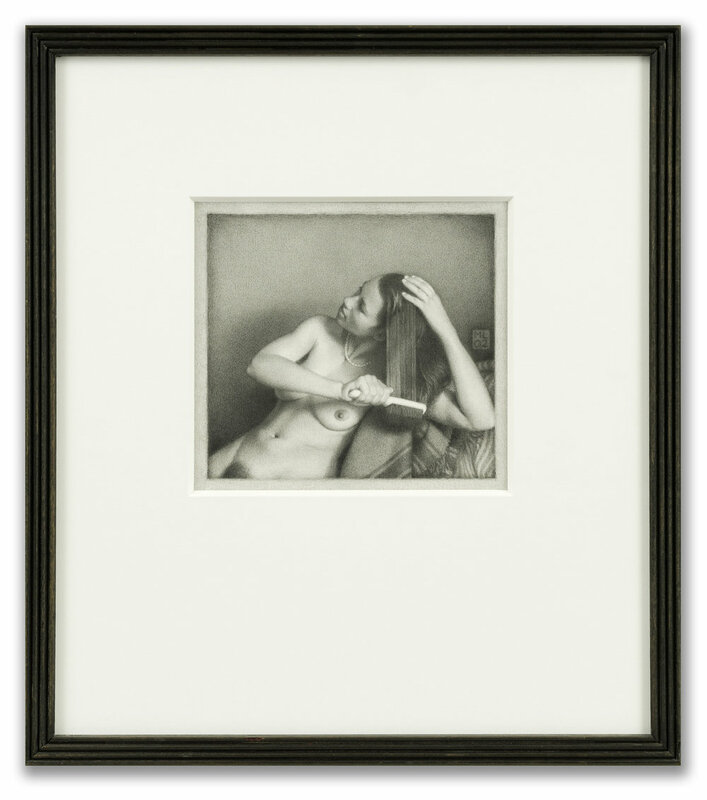 Graphite pencil on paper, 18.5cm x 19cm, framed. Michael Leonard, (British b.1933), 'Towards: The Pulley', 1979. Mixed media collage, 48cm x 41.5cm framed. This collage was created by the artist, collating together photographs, sketches and colour studies he used in preparation of his painting 'The Pulley' in 1979. Michael Leonard (British b.1933), Changing Head, 1991. Screen print, unsigned, 36cm x 39cm (plate size), 76cm x 57cm (paper size), unframed. This is a print of Leonard’s Changing Head painting from 1982. The painting featured on the front cover of Larry Kramer’s book, ‘Faggots’. Michael Leonard, (British b.1933), Bather with striped towel, 1980. Sanguine conté on paper, 42cm x 29cm, dated 'July 1980'. Michael Leonard, (British b.1933), Shirt off and on fast; back view x 3, 1974. Conté on coloured paper, 42.5cm x 26cm, signed & dated 'July '74'. Michael Leonard, (British b.1933), Singlet off and on fast; back view x 4, 1974. Conté on coloured paper, 40cm x 25cm, signed and dated 'Aug '74'. Michael Leonard, (British b.1933), Shirt on fast; side view x 3, 1974. Conté on coloured paper, 40cm x 29.5cm, signed & dated 'August '74'. Michael Leonard, (British b.1933), Bather stooping low, 1990. Graphite pencil on paper, 29cm x 20cm, dated 'Dec '90'. Michael Leonard, (British b.1933), Stooping, taking off Levis, 1974. Conté on coloured paper, 38cm x 32cm, signed & dated 'August '74'. Michael Leonard, (British b.1933), White vest and pants, 1974. Conté and gouache on coloured paper, 30.5cm x 11.5cm, signed, titled 'Barry' & dated 'Jan '74'. Michael Leonard, (British b.1933), Eating grapes, 1990. 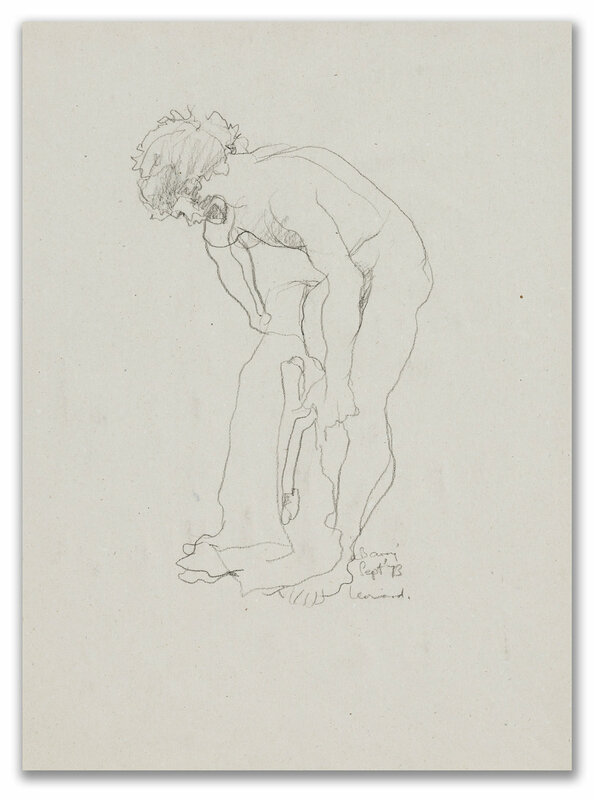 Michael Leonard, (British b.1933), Dancer with a towel; back view, c.1980. Graphite Pencil on paper, 29cm x 18cm. Michael Leonard, (British b.1933), Pulling on pants. Graphite pencil on paper, 32.5cm x 25cm. Michael Leonard, (British b.1933), Lying back; front view, 1972. Graphite pencil on paper, 35.5cm x 25.5cm, titled ‘Barry’ & dated ‘Oct 26 ‘72’. Michael Leonard, (British b.1933), Stepping into Levis, 1979. Graphite pencil on paper, 24cm x 20cm, dated 'July 11 '79'. Michael Leonard, (British b.1933), Man lying on his front, 1972. Conté coloured paper, 17cm x 20.5cm, titled 'Barry' & dated 'Nov 20', '72’. Michael Leonard, (British b.1933), Sitting turning away, 1973. Conté on coloured paper, 34cm x 21cm, signed, titled 'Barry' & dated '19 June '73'. Michael Leonard, (British b.1933), Pulling on Levis, 1973. Conté on coloured paper, 37.5cm x 27.5cm, signed, titled 'Barry' & dated 'Sept '73'. Michael Leonard, (British b.1933), Stepping out of Levis; back view, 1974. Sanguine conté on coloured paper, 34.5cm x 29cm, signed & dated 'May 9 '74'. Michael Leonard, (British b.1933), Tattooed man removing T-shirt, 1978. Conté on coloured paper, 20cm x 28cm, signed & dated 'August '78'. Michael Leonard, (British b.1933), Pulling on sock; side view, 1978. Graphite brush & Dr Martin's watercolour, 18cm x 9.5cm. Michael Leonard, (British b.1933), Pulling on shirt fast, 1981. Conté on paper, 19.5cm x 19.5cm, signed 'ML81'. Michael Leonard, (British b.1933), A Good Age; Tolstoy, 1977. Dr Martin's watercolour, 33cm x 28cm. Original artwork from the book ‘A Good Age’, Crown Publishing, 1977. 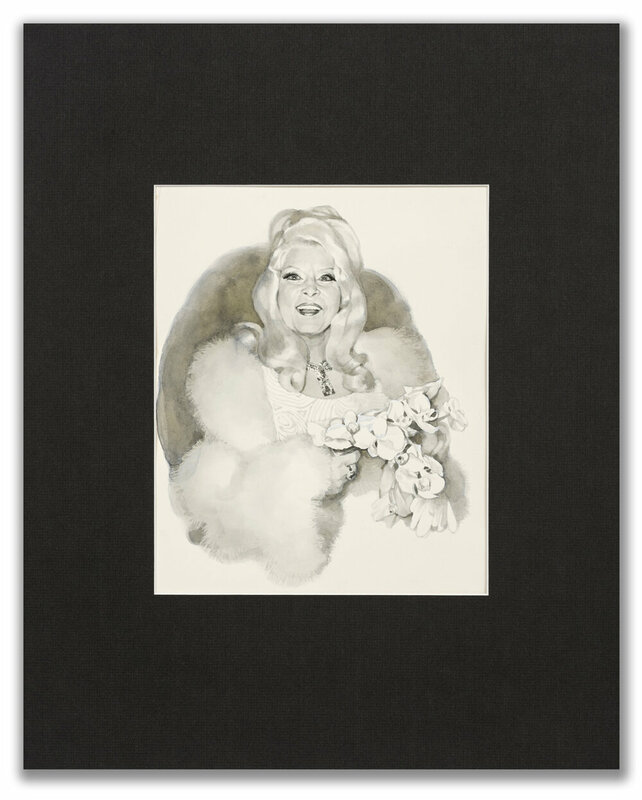 Michael Leonard, (British b.1933), A Good Age; Mae West, 1977. Dr Martin's watercolour, 33cm x 25cm. Original artwork from the book ‘A Good Age’, Crown Publishing, 1977. Michael Leonard, (British b.1933), A Good Age; Picasso, 1977. Dr Martin’s watercolour, 33cm x 21cm. Original artwork from the book ‘A Good Age’, Crown Publishing, 1977. Michael Leonard, (British b.1933), A Good Age; Arthur Rubinstein, 1977. Dr Martin’s watercolour, 31cm x 30cm. Original artwork from the book ‘A Good Age’, Crown Publishing, 1977. Michael Leonard, (British b.1933), A Good Age; Frank Lloud Wright, 1977. Dr Martin’s watercolour, 33cm x 27cm. Original artwork from the book ‘A Good Age’, Crown Publishing, 1977. Alkyd-oil on masonite, 65cm x 51cm, framed. Michael Leonard, (British b.1933), Relaxing Bather, 1992. Graphite pencil on paper, 17.5cm x 21.5cm, framed. Michael Leonard, (British b.1933), Changing Room II, 2006. Alkyd-oil on masonite, 57cm x 52cm, framed. Michael Leonard, (British b.1933), Taking Off, 2005. Alkyd-oil on masonite, 47cm x 42cm, framed.